Qualification: MBBS/ BDS candidates from a recognised University registered with Delhi Medical Council/Delhi Dental Council and completed/ likely to complete Internship by 05.02.2019, can apply. Candidates who have completed Internship on or before 05.02.2017 need not apply; as such candidates would not be eligible. Those Candidates who have already done one year Non-PG Junior Residency is not eligible for the said posts. Pay Scale: Rs.56,100 - 1,77,500/- of the pay matrix + other allowances as admissible as per orders issued by the Government from time to time. Application Fee: Rs.300/- for SC/ ST candidates and Rs.500/- for all other candidates. 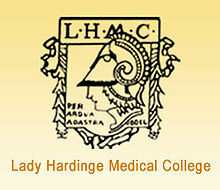 Venue: Director, LHMC & Smt. S.K. Hospital, New Delhi.